Home > Mother's Day Dinners! > The "Mariner" "Romantic" & "Extravaganza" Lobster Dinners! > The "Mariner" Lobster Dinner for Four! "The Mariner" Lobster Dinner for Four! Includes: Four 1 1/4 lb. Live Maine Lobsters; Two 18 oz. New England Clam Chowders; Two 18 oz. Premium Lobster Bisque; Lobster Bib and Pick sets and of course, oyster crackers! The "Mariner" "Romantic" & "Extravaganza" Lobster Dinners! • Lobsters & Chowder! • Maine Shore Dinners! You'll receive Four 1 1/4 lb. Live Maine Lobsters; Two 18 oz. New England Clam Chowders; Two 18 oz. Premium Lobster Bisque;Lobster Bib and Pick sets and of course, oyster crackers! 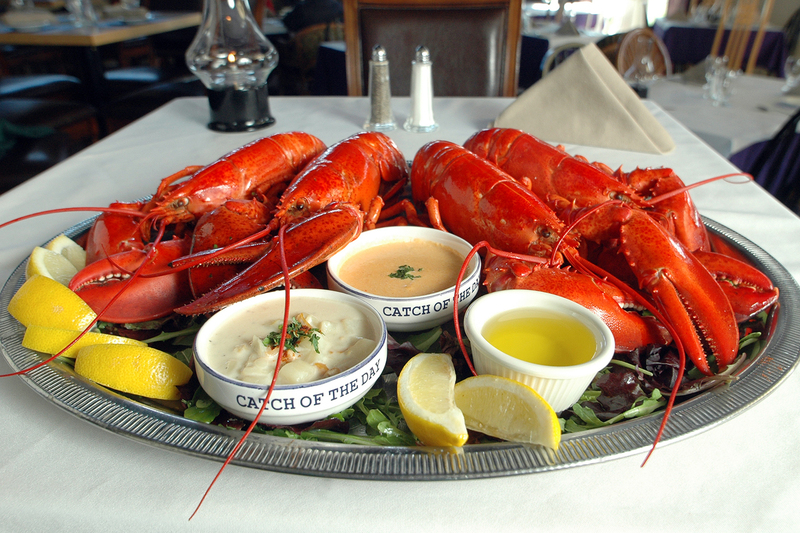 Order Our Famous Mariner Lobster Dinners By 10am EST, And Enjoy It For Dinner Tomorrow! Our Lobster Dinners Also Make A Great Gift Idea For Your Favorite Seafood Lover! How Easy Is That! We loved our gift, it was fresh and lively and just perfect! What a GREAT company you have, and the girls on the phone were soooo sweet! We will order again soon! We have ordered and twice and are getting ready to order for the third time. Yummy!! wonderful service on line and, for the AMAZING food. We loved what we ordered. GREAT! What a wonderful, fun, delicious treat you provide! Great Dinner! Loved every drop of the chowder and the lobsters were fresh fresh! We wanted to thank you for such an outstanding product! From the customer service to the lobsters and chowder, great job! This was for a birthday dinner at home instead of going out. It was a great meal,and we will be back to order again! thanks so much for a wonderful evening.